This artist’s concept shows a supermassive black hole with millions to billions times the mass of our sun, like the one in the film Interstellar. Kip Thorne has recently been in the public eye as the physicist who brought real-world physics to the science fiction epic "Interstellar." But this isn't Thorne's first foray into discussing this kind of mind-bending science with the public: 20 years ago, Thorne wrote a best-selling book about black holes and other awesome astrophysical phenomena for a general audience. Thorne's book, "Black Holes and Time Warps: Einstein's Outrageous Legacy" (W. W. Norton & Company, 1994), touches on many of the same subjects discussed in his more recent book, "The Science of Interstellar" (W.W. Norton & Company, 2014), including the possibility of interstellar travel through wormholes and the potential for time dilation around black holes. Two decades later, Thorne's first book remains a premier resource on the subject. Kip Thorne's popular science book on the history and science of black holes and twisted space-time is still relevant 20 years after its publication. "I actually hadn't realized it was the anniversary, because I've been so swallowed up with 'Interstellar,'" Thorne told Space.com. (Thorne is also a theoretical physicist at the California Institute of Technology.) "I do wish that I had time to update the book. I hope to do so in the next few years." So what new physics would Thorne add to an updated version? First: new ideas about how exactly a black hole would kill you. 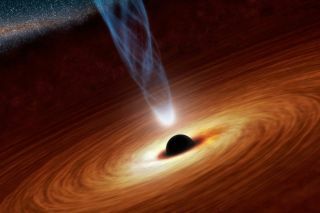 But newer theories suggest that black holes might kill you by crushing rather than stretching. "When you fall into a black hole, everything that falls in after you over millions of years, as seen by you inside the black hole, comes pounding down on you in a fraction of a second, because of the enormous differences of time flow," Thorne explained. This would create a singularity: a location where the laws of physics break down and measurements of gravity go to infinity. "That produces sort of a 'sheet singularity' descending on you at the speed of light." This idea, called a mass inflation singularity, was proposed in the 1990s. More recently, theorists showed that the crushing death would also come from below. "Stuff that fell into the black hole before you, some of it will backscatter back up toward you," said Thorne. This could happen with any and all of the material that had ever fallen into the black hole during its lifetime. The material would create a shockwave singularity coming straight up at you. This all remains theoretical, of course, as no one has ever actually fallen into a black hole. : Theoretical physicist Kip Thorne, who helped bring real science to the movie "Interstellar." Some of Thorne's scientific theories seem to border on science fiction. Thorne and other researchers studying black holes have had heyday over the last 20 years as supercomputing power has steadily increased. Now researchers can create simulations of the incredibly complex circumstances surrounding black holes and watch the simulations play out. This includes the twisting and warping of space-time itself, distortions that could travel through the Earth and (to a very small degree) change how quickly time passes at one point compared to another. "Until [recently], our understanding of space-time was sort of as though we had seen the surface of the ocean on a very, very calm day," Thorne said. "We'd never seen it in a storm. We'd never seen breaking waves. We'd never seen waterspouts — tornadoes over water. "In a similar way, in both theoretical and observational studies, we had only seen black holes when they're more or less quiescent," he said. "We'd not seen or learned much about how they behave when they collide. And their collisions create wild oscillations in the rate of flow of time and in the whirling motions of space, in complicated vortex-like or whirlpool-like behaviors. And in the last decade, particularly the last five years, thanks to supercomputer calculations, we've begun to learn about space-time when it is behaving like it's in a storm." The Laser Interferometer Gravitational Wave Observatory, or LIGO, in Louisiana is currently undergoing upgrades to become Advanced LIGO, and Thorne says he's highly optimistic that the upgraded observatory will finally detect evidence of gravitational waves. That data, combined with theory, will further scientists' understanding of the warping of space-time. Another subject high on Thorne's list of topics he'd like to discuss in an update of his book is an idea used in the movie "Interstellar": that the universe human beings see is embedded in a larger universe of a higher dimension. The visible universe (called the "brane," short for membrane) has three spatial dimensions and one time dimension; a fourth spatial dimension called the "bulk" may be all around people, but they can't perceive it. In the movie "Interstellar," the "bulk" is called "the fifth dimension." "The presence of that higher dimension could have deep impact on the laws of physics in our universe," Thorne said. Thorne mentioned specifically the work of physicists Lisa Randall at Harvard and Raman Sundrum at the University of Maryland, who have proposed that the bulk might be something scientists can detect through experiments. Randall discussed the details of this theory in the book "Warped Passages" (Harper Perennial, 2006). Other experiments that don't involve a multi-billion-dollar machine have also searched for the "bulk," but so far those have turned up nothing. The theories currently don't give any specific indication of where a solution might be found. "So it's a bit of an open-ended search," Thorne said. Thorne's book is not exactly light reading (the paperback is a hefty 527 pages), but that doesn't stop it from being a page-turner. It offers accessible explanations of the science responsible for black holes and other mind-boggling physical phenomena in the universe. Readers will find the occasional equation and lots of helpful images and diagrams. Anyone interested in learning more about the history and science of black holes should consider giving it a read.